Warning Andy has told me these items will be in raw form and not poweder coated as they are prototypes and this will save for me. either way paint is cheap and I know how to prep and paint! I like the looks of the x-member. I am asumming that his LOng arms are Radias arm style ones? Doesn't seem like there will be much connecting your front suspension to the unibody? It seems like that would easily rip out of the unibody with the mounting surface being over such a small area, no? The piece itself looks pretty beefy, but I don't know.... I'm no fab man so maybe I'm wrong. It bolts and welds in. 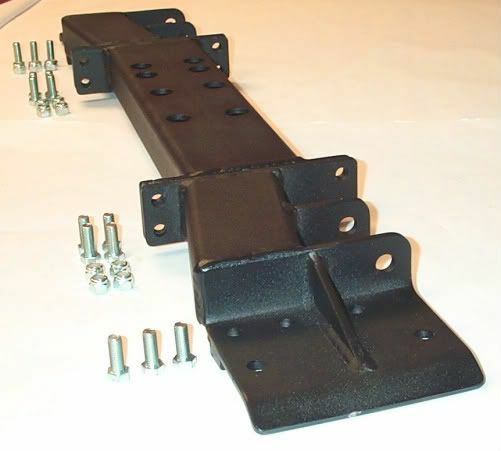 This cross member bolts with the 4 factory cross member holes, as well as 6 additional holes that get drilled through the pinch seam, as well as full welds to the perimeter of the outer mount. By doing so it is secured to all 4 pcs of the uni-body. for this to come apart would require the entire uni-body to come apart. Most cross member systems only utilize half of these. total cost of shocks was 202.96cause I had to also get a stem eliminator kit cause the lift I was getting didnt give me the travel I was looking for. Yeah, 5" is just about the limit without an SYE. You might end up needing a longer shaft with that height. However, consider that with 8" front and 6" rear, the Jeep will be level. This might be a little more doable for you. The front if my math is correct will be 5.5" Rear is debatable. I'm not sure how the Dadota pack comes out for lift.